Three Pass Everest Base camp trekking is famous trekking route in Everest region. Everest’s Three Pass Trekking is an ideal deal for truly adventure lovers. This is the one of the highest-altitude trekking route in the world. The Three Passes refers Kongma La (5527 m/ 18135 ft), Cho La (5420 m/ 17783 ft) and Ranjo La (5375 m/ 17634 ft) mountains with world’s most spectacular mountain panoramic land. From Namche Bazaar to the Gokyo Valley and on to Mount Everest Base Camp Three Pass Trekking route thrills the mountain lovers. The route offers you mesmerizing Himalayan scenery . Not only that you may explore the tradition of Tibetan Sherpa culture and the Monasteries along with the wilderness of its flora and fauna in Sagarmatha National Park. This day we will gives you the diteals information about trekking program and coordinate any last­minute arrangements. After/before the staff meeting, we will take you sightseeing with a tour guide to visit the highlights of Kathmandu ­ Pashupatinath, Boudhanath Stupa, Swaymbhunath and Patan Durbar Square. Overnight at hotel. Your early flight to Lukla today will take approximately 30 minutes; from here you will trek to Phakding, descending 200m over 3 hours. You will catch a glimpse of some great mountains such as Nupla (5885m) above Kongde Ridge, Kusum Kang (6367m appears on the right a little later.All along you will be following the northern (left) bank of the Dudh Kosi River. It is important to take these first few days slowly to enable your body to acclimatise and to enjoy the passing scenery and culture. Today begins on level ground, relative to the environment in which you are! You will cross the river on a high suspension bridge and begin to climb up to Monjo (2800m) and on to the gateway to the Sagamartha National Park Entrance in place to protect and preserve this beautiful environment. There is a good rest stop on the way up where you will see people gathered, admiring the first real chance to see Everest in the distance. On the way up today you will be rewarded with views of Kusum Kangaru, Thamserku, Konde­Ri and Tawache Peak before eventually arriving at Namche after about 5 hours. We start early in the morning to catch the dramatic views from Kala Patthar with the sun rise on Mt. Everest. However, we need to get prepared for an early morning, dark and cold temperature (-10 ) departure beforehand. Further, there is always the potential of chilly winds which are quite common. Beautiful peaks Lingtren, Khumbutse, Changtse tower to the east even as Everest begins to reveal itself emerging between the west shoulder crest and Nuptse. . After several hours of ascent, we will be Kala Patthar. From this juncture, we scramble to climb the rocky outcrop near to the summit marked by cairns and prayer flags. As we reach the top, we sit on the Kala Patthar where our eyes rook taking in the unbelievable Himalayan Panorama, wandering from one mighty massif to another. We take as many pictures as we can and take the in view with our mind’s eye to last lifetime. On being back to Gorak Shep, we have breakfast and wait other participants to return back. Those participants who plan to visit Everest Base Camp today will have early breakfast to start early as Everest base camp hike takes longer time (4 – 5 hrs) than the Kala Patthar hike. Upon return back to Gorak Shep, the group will have lunch together; and afternoon time is taken to descend down to Lobuche for a good night’s rest. From Lobuche, we pass through Khumbu Glacier. Climbing up we reach Kongma La. we will pass the Pyramid shaped Italian Research Centre at just over 5,000m. We enjoy the views of the wide basin dotted with frozen lakes. Again we see the views of Cholatse, Pokalde, Nuptse, Lhotse, Makalu and Ama Dablam. Then we turn and walk through the stony trail. While descending down the Niyang Khola valley, we enjoy the great views of Amphu Lapcha Pass and Island Peak. Trekking further we get to Chukkung. Now we are getting closer to the Khumbu Region. There is a famous monastery at Pangboche believed to have been the oldest in the Khumbu region. 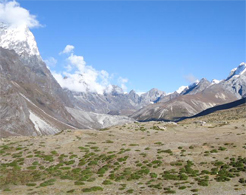 From Pangboche, we descend down the alpine desert and back into greenery of pine forests. The path leads to a steep uphill climb into Tengboche. We pay our visit to the famous Tengboche Monastery. From Tenboche, we make a steep descent and the trail leads us back along the Dudh Kosi River. We keep a lookout for wild life such as mountain goats, snow leopards, colorful pheasants, etc., while passing through the forest by the trail. After passing a Chorten, we reach the army camp at of Namche Bazaar where we want to take a long last look back to Lhotse, the tip of Everest and Tengboche. The final steep climb traverses the hill side taking us to Namche Bazaar. We take a nice hot shower and have very relaxed sleep in our room in Namche Bazaar. The trail descends steeply downward with crossing the suspension bridges over the Dudh Koshi and its tributaries the trail becomes more level and natural.Although we are travelling the same route down, we feel completely different views. We snap a mixture of open plains, rhododendron and pine forests, and in the distance snow covered peaks. We walk through the Sherpa villages’ noticing impressive faith in Buddhism and culture of prayer stones and prayers flag while we walk through the villages. Upon arrival in Lukla, we stretch those sore legs and recall the experiences of the last couple of weeks. We experience the culmination of a fantastic trek on a happy note with everyone back safe and sound with smile on faces! Overnight at Lukla. We fly back to Kathmandu in the early morning flight drops us at Kathmandu. * Domestic Airport picks up & drops by private vehicle. * Three star hotel in Kathmandu with breakfast. * Guided Kathmandu city tour with entrance fees by private vehicle. * All your standard Meals (breakfast, lunch and dinner) during the trek. * Teahouse accommodation during the trek. * Government licensed English speaking Guide and Porters to carry your luggage during the trek (1 porter Between 2 Person basis), their food, accommodation, salary, insurance, equipments,medicine. * Round Trip flight fare KTM –Lukla­­ KTM & domestic airport taxes in Kathmandu and Lukla. * Sagarmatha National Park fees. * Trekker’s information management system(TIMS) card fee. * Mosaic adventure duffel bag, jacket and sleeping bag to use during the trek * Farewell dinner in Kathmandu * All our government taxes and official expenses.